The dollar bounced back on Friday, after a couple of economic indicator misses this week, the greenback is higher against all major pairs. Major pairs and commodities are lower against the greenback ahead of the weekend. The American currency did not manage to overturn the losses posted during the rest of the week. On a weekly basis the USD is lower against all majors except the Japanese Yen. A slowdown in the pace of inflation, miss in retail sales expectations and a softer tone on trade from the Trump administration were the three major factors for the softness of the currency. Rate differentials also helping the USD. This week was mostly a non event for the Bank of England (BoE) and the European Central Bank (ECB). Although the Sept rate hike by the Fed is priced in, it also shows its the only economy with some momentum to even lift rates. Next up in the economic calendar are the Bank of Japan (BOJ) and the Swiss National Bank that are not expected to modify their monetary policies. The escalation of trade tensions was a positive for the US dollar as investors sought a safe haven during times of uncertainty. As potential olive branches are put forward there is optimism that Canada will join the US-Mexico agreement and talks with China could lead to closing the gap between the two points of view on trade. US President Trump tweeted on Friday that the a meeting with China is no guarantee of anything and reports in the media suggest the $200 billion US tariffs are still on the table. A September rate hike is still fully priced in, but the inflation and retail sales miss did slim down the probabilities of a follow up rate hike in December. The American economic calendar is short on blockbuster releases with Washington development to guide markets as trade tensions have eased, but are far from resolved. The euro rose almost 1 percent this week with risk appetite returning to markets and strong wage growth in Europe. The European Central Bank (ECB) did as expected and held rates signalling that it will end its QE program at the end of the year and continued to maintain interest rates low through the 2019 summer. Investors were not given any new information and instead bought the currency on improved international trade environment. The olive branches are just now entering the picture, and ECB economists could not have predicted the timing as they also announced a downgrade of their economic projections, citing trade worries. Upcoming European inflation along with service and manufacturing PMIs will bookend the economic calendar in the EU. The gap between interest rates will continue to grow as the U.S. Federal Reserve pushes on its tightening policies as growth fails to spark momentum in Europe. 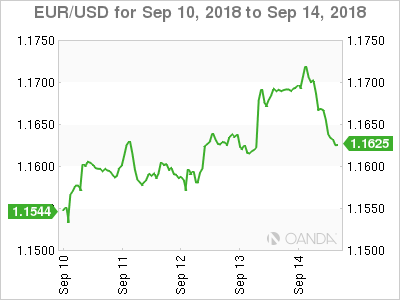 Fed rate hikes are priced in into the USD, but signs of European slowdown or the US economy hitting a higher gear could be a gift for dollar bulls. The Canadian dollar fell on Friday. 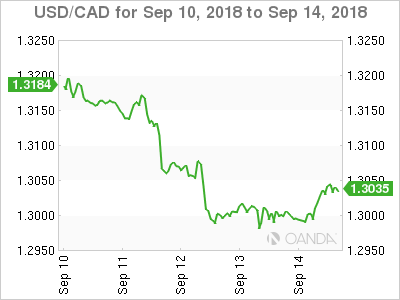 After the Trump administration softened its stance on international trade, in particular by reopening trade talks with China, NAFTA optimism boosted the loonie. Traders did not feel confident in carrying over short dollar positions into the weekend and the greenback saw a recovery on Friday. The loonie advanced 1 percent during the week and next week’s inflation and retail sales data on Friday are crucial for the fate of a Bank of Canada (BoC) interest rate hike. NAFTA headlines will roll in as the team of negotiations get back to work with the aim to add Canada to to US-Mexico agreement. Expectations are mixed on NAFTA, as Canada seems ready to make concessions on dairy but the US and Mexico continue to press for a trilateral deal while also adding they are ready to forge ahead if its only a bilateral one. Oil fell 0.35 percent on Friday compounding on losses seen on Thursday, but will head into the weekend with a 1.09 percent gain. Supply disruptions have lifted prices after the 2014, be it the Organization of the Petroleum Exporting Countries (OPEC) and major producers agreement to limit their output to weather and geopolitical disputes. Hurricane Florence in the US was downgraded and with it the negative short term effect on potential disruptions. IEA reported today that OPEC is starting to ramp up production by 420,000 daily barrels more than making up for the impact that the sanctions on Iranian exports will have on supply. Global demand for crude has not shown signs of recovery and if producers start pumping there is a risk that oversupply could once again bring instability to oil prices. Geopolitical factors like the US-China trade tensions will continue to put downward pressure on crude prices as higher levels of protectionist measures tend to slow down global growth. 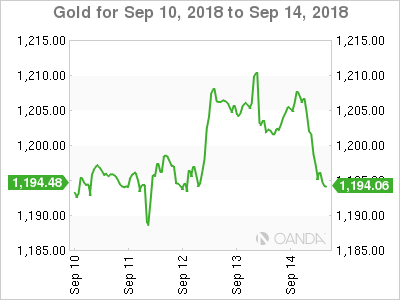 Gold fell 0.46 on Friday after a bounce in the US dollar at the end of the week. Risk aversion has been the main dollar of US strength as trade war concerns could have a deep impact in global growth. Commodities have recovered this week after the Trump administration has softened its tough stance with China with bilateral talks to restart in a couple of weeks. Friday’s move is also explained by investors limiting their exposures as the weekend approaches, given that geopolitical risk could rise at any moment. The move gave some breathing room to the greenback as it is on its way to erase the majority of its losses against the yellow metal.